My favorite (non-alcoholic) drink this hot, hot summer is half lemonade, half iced tea. You may know it as an Arnold Palmer. I refuse to call it that, because for some reason, the name is difficult for me to enunciate. I have to stop and think about it to make sure it comes out right, and even then I feel like I have a cherry pit rolling around on my tongue. And no offense to the famous golfer in question, but not even James Bond would sound cool ordering an Arnold Palmer, even if he followed it up with “shaken, not stirred.” Or in my case, slurred. I kept at it for a while, as it was kind of addictive, and came up with a good dozen names I wouldn’t turn down. The rest didn’t make the cut, but even I have to admit that the random name generator beats the phone book any day. Whatever character name you choose, you might want to run it by friends or a critique group to make sure they can get their mouths around it. Have you ever named a character using a random name generator? 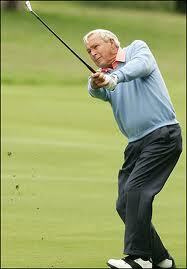 I can't pronounce Arnold Palmer either. What were his parents thinking??? I love drinking Arnold Palmers! I have been ordering them for years, so it has gotten easier to say it. Thanks for sharing the Random Name Generator. This is awesome and something I will definitely have to book mark. I've ever heard of the random name generator either! Sounds neat. It will work for naming characters, unless they have a specific heritage, such as Greek or Spanish or something that requires them to have that type of name. I haven't tried this but think I'll go hang out there for a while and see if I can come up with a couple of good names for a short story I'm working on. Never heard of an Arnold Palmer. My favorite summer drink is sun tea that's heavy on the peppermint. I never knew the name generator existed. My Fave: Nick Winters. Like the Palmer...maybe we could call it that, 'cuz like you, I don't do the whole name easily either...kind of like trying to stumble through "Will Rogers Airport" with a sky full of planes...never comes out right. "Gimme an Arnie" and see what you end up with. Thanks for the name generator. So then I ask, does the name fit the character I think I see, or does the name create the characters traits? I'm glad you're all having fun with the name generator. Maybe we could use it to rename the Arnold Palmer...? Nick Winters is definitely easier to pronounce!